If you ever wonder how to configure “vlan select” or “interface group” feature in a Converged Access (3850/3650/5760) setup, here how you do it. (I am using IOS-XE 3.6E for this post). This feature is known as “Vlan Group” in IOS based controller(In GUI of these controller you still see it as interface group for familiarity). Here is my topology for the post. 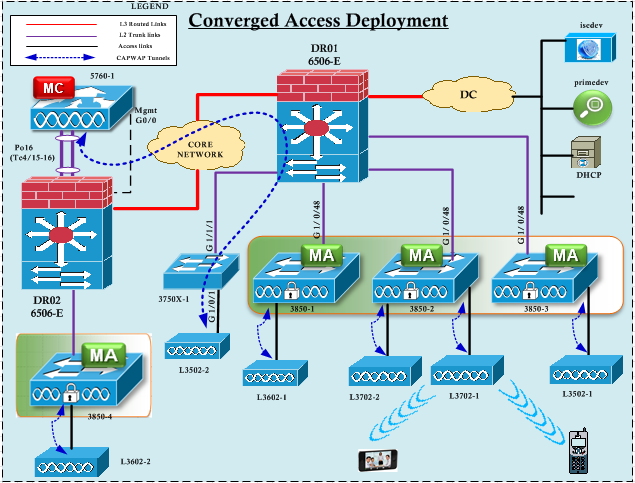 In my topology 5760 acting as MC & 3850 stacks acting as MA.In this post I have configured “vlan group” on 3850-2 MA. Let’s say you have four different subnets to be assigned to a single WLAN. “Vlan Group” configuration is a very straight forward configuration in CLI (one CLI entry). In Converged Access wireless users CAPWAP traffic will be terminating at your access layer. So your access layer switch should have those user vlans defined like any other wired vlans. Unless you have Routed-Access, all your vlans SVI are defined on your distribution switch where these access switches are connected. 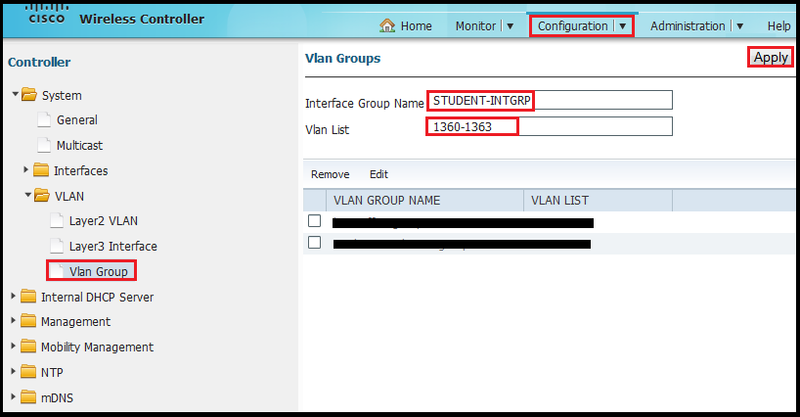 3850-2(config)#vlan group STUDENT-INTGRP vlan-list ? Now when you are defining “client vlan x ” under WLAN configuration, you can give the “Vlan Group” name instead of a single vlan ID. Here is a sample configuration of a 802.1X SSID where clients are map to defined vlan group (Refer WLAN Config with 3850 for full configuration including RADIUS) . So when connecting to this SSID, users will get IP from those 4 different subnets in vlan 1360-1363. Remember that you have to configure this under AP-Group -> WLAN if you are using any AP-Groups. You can verify using “show ap groups” command to see correct interface group/vlan group is mapped to your WLAN. Now you can test this by connecting multiple clients to see whether they are getting different subnet IP. You can use “show wireless client summary” & “show wcdb database all” commands to verify that your client connecting to WLAN ID 22 are getting IP addresses from different subnets across vlan 1360-1363. If you want to do this via GUI, you can do the same. Here is the steps to do this (I would not think anyone like to define L2 switch configs via GUI 😯 but option is there for anyone willing to go in that path as well ). You have to go “Controller -> Configuration -> VLAN” section & add your required vlans to the switch & then group them. Then you can go to “Wireless -> WLAN -> Select Your WLAN -> General -> Interface/Interface Group” field to bind vlan group to WLAN. I was wondering if you have a post showing a 5760 using ISE and creating a single WLAN with 4 different subnets to assigned to the single WLAN and having ISE dropping the user on one of those 4 subnets depending on credentials of the user. I need to create the VLANs on the 5760, correct? (i.e. “vlan 999”) but not an SVI. “IP dhcp required” is needed on the WLAN in order to get an IP address, correct? I am planning to use multiple VLANs for a single WLAN and drop the user on a particular VLAN depending on their credentials authorized by ISE. I don’t know how to do the ISE configuration but the ISE configuration will be done by a Security Engineer, but if you have a sample configuration, I appreciate it if you can share it. Just so this is clear to me. If i have 3850 defined as MA and the client Vlan is defined as Layer 2 on the switch. I have ip helper configured for these vlan on my Layer 3 switch that the MA is connected to. Do i need to enable DHCP snooping on the MA switch ? I have an issue where the DHCP server (win2008) get some addresses marked as bad_address in the dhcp scope and i wanted to turn off dhcp snooping to see if this is casing the problem.